These are lyrics by Shakira that we think are kind of funny. Geez, that's nice of Shakira. Normally, this type of conflict would be resolved in a catfight of major proportions, the 'other girl' being the target and one in blame. 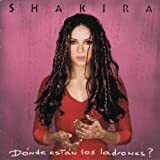 Shakira's, "Ready For The Good Times"
I've never read any survival guides that tell you how to deal with seven legged cats!! "Kitchen phobia" sounds funny when Shakira says it because there is no such thing! (Why would anyone be afraid of kitchens?) Also, it is funny that she believes in ghosts! Let's just say that they would have to be incredibly big for that confusion to happen.